NASHVILLE, TENNESSEE (Dec. 1) – Award-winning duo Stranger Friends will kick off their "12 Days of Regifting" campaign on December 12 with an appearance at Marathon Music Works in Nashville. The feel-good campaign takes its name from the duo’s new holiday single, “Regifting,” released to all digital service providers today. Each morning, band members John Martin and Jamie Floyd will reveal a new item to give away on social media. The winners will be announced each night. 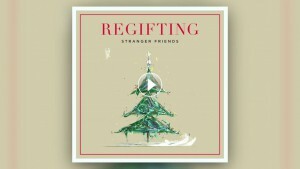 Stranger Friends will conclude the "Regifting" campaign on December 23 at the Country Music Hall of Fame and Museum. The duo will play original music as part of the museum’s esteemed Songwriter Session, which is free to all museum members and visitors. Martin has had two songs recorded by Garth Brooks (“Ugly Christmas Sweater,” “Cowboys Forever”). Floyd has written songs for Dolly Parton’s A Country Christmas Story (2013) as well as artists like Ronnie Dunn, Brian McKnight, Ashley Monroe, Nashville’s Hayden Panetierre, and Kellie Pickler. “Since John had written ‘Ugly Christmas Sweater’ with Garth, I was thinking about writing a Christmas song with him that could work for Trisha Yearwood next – and that’s how the groove for ‘Regifting’ was born. The spunky lyric to match came soon after! Sometimes regifting gets a ‘bad wrap’ ... but it isn’t bad if you give away something good,” Floyd adds. Stranger Friends won the award for Best Original Song at the 2017 Nashville Film Festival for “Yet to Come” from the Burt Reynolds movie, Dog Years. The duo released a self-titled debut EP in October. They were invited by Little River Band to perform at the Carols by Candlelight concert in Nashville on December 12.